The evidence is piling up that too many Americans are wasting away in prison. 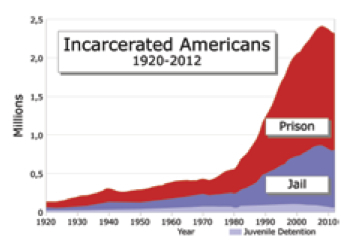 The National Academy of Sciences, for example, recently concluded in a major two-year study that the United States “has gone past the point where the numbers of people in prison can be justified by the social benefits.” Other groups, like Human Rights Watch, the Brennan Center for Corrections, Corrections Today and the University of Chicago Crime Lab, have also raised their voices. Pope Francis, in his address to the International Criminal Law Association on May 30, called for major reforms of criminal justice systems. Here are some basic statistics. Having quadrupled in the past four decades, the prison population in the United States today is 2.2 million, or about one of every 100 adults. This rate far exceeds that of other Western democracies. Maintenance for each prisoner costs taxpayers $30,000 a year. Over half of inmates are locked up for nonviolent offenses. According to “Nation Behind Bars,” a recent report by Human Rights Watch, nearly one-third of those serving life sentences do not have the possibility of parole, and more than 40 percent of all federal criminal prosecutions are for immigration offenses. For every 100,000 Americans in each of the following groups, according to the report, there are 478 white males, 3,023 black males, 51 white females and 129 black females in prison. Too often the system fails to treat prisoners as human beings; each person has a right to fair trial and punishment and equal protection under the law. President Franklin D. Roosevelt spoke for “the forgotten man at the bottom of the economic pyramid.” The forgotten men and women of today are the 2.2 million in prison, committed by a public that too often bases its understanding of prison life on films and television and has been fed tabloid headlines about these “monsters” from the moment of their arrests through their trials. The surge in imprisonment began in the late 1960s with President Richard M. Nixon’s campaign for “law and order.” The accusation of being “soft on crime” replaced the “soft on Communism” of the 1950s and has continued to influence American politics. The criminal justice system has changed significantly over the past 40 years. People are doing more time than ever before. Sentences have grown longer thanks to legislatures that want to appear tough on crime, most notably through mandatory minimum sentences and “three strikes” laws. States have also farmed out prison management to private contractors who run the institutions for profit. More convicts mean more money for their investors. Families bear the consequences of incarceration. In the last two decades of the 20th century, the number of children with incarcerated fathers in the United States shot up from 350,000 to 2.1 million. In addition, former inmates have a hard time finding work or housing, and families can crumble as the behavior of children is influenced by the jail time of their parents. New laws must address the new reality. The reformed prison of the future, aided by public and private high schools and universities, should educate inmates not just with job skills but with the liberal arts, instruments for moral rejuvenation. Sentences must be shorter. There should be alternatives to incarceration for those who suffer from addiction or mental illness. Elderly or ill prisoners who are not likely to re-offend can be released. Prisons must be evaluated on their success or failure in reducing recidivism. Judge Richard A. Posner writes in the New Republic (6/9): “The worse the treatment meted out to prisoners, the more recidivism there is, and thus the more crime.” Our country must transform the prison from a trash can where we dump offenders to an instrument for the public good. Your editorial succinctly captures the sorry state of our "correctional" system. Its dysfunction has been apparent for many years. Not only does it woefully fail to "correct" the conduct of prisoners, it is far more successful at producing better trained criminals upon their release. Recently, some realistic hope for reform has emerged. Conservative Republicans (many of whose policies helped exacerbate the problems) are now championing reforms. Governor Rick Perry of Texas, former House speaker Newt Gingrich, Senator Rand Paul and anti-tax lobbyist Grover Norquist have embraced ideas such as repeal of mandatory minimum sentences; increased rehabilitation programs; and non-incarcerative sanctions for low level drug offenses. Let's hope the Congress, whose dysfunction and inability to agree on any legislative reforms has been staggeringly depressing, can come together to pass some common sense reforms. While there have been sporadic attempts to meaningfully integrate schools and universities into the reform movement, as recommended in the editorial, stronger involvement by academia should be encouraged by our civic and elected leaders. In December of 2013 Dustin Friedland and his wife Jaime were Christmas shopping at the Short Hill Mall in NJ. Jaime had been in the car. When Dustin was walking to the car he was approached by Hanif Thompson 29,Kevin Roberts, 35; Basim Henry, 32; and Karif Ford, 31. They demanded the Keys, Dustin knew Jaime was in the car and refused for fear that they would take her as well. A struggle ensued, and Dustin was shot and killed in front of his wife. ALL four of the murderers had long extensive criminal histories (yet notice their age). Dustin is Dead, and Jaime has live with the mental images of her husband being murdered. And I can only wonder if he would be alive and she with some degree of inner peace if Hanif, Kevin, Basim and Karif had been in prison longer? Prisons should not be filthy and overcrowded and prisoners still retain basic human rights but please be careful when you make them the sole victims. Forty four years ago I was in my mid-twenties and a MSW student at Boston College's Graduate School of Social Work. My second year field placement was at Norfolk State Correctional Facility and at Framingham State Correctional Facility for Women. This was the year of the riots in Attica. The only thing that seems to have changed in our prison systems is that they are better at controlling the riots that occurred over the treatment of the inmates and the conditions in which they had to live. Most of what prisoner's protested about are the same as they were over four decades ago. Some relief in CA comes from the federal courts about overcrowding. No politician from either party (and CA is heavily dominated by Democrats) has truly addressed the abominable l issues the State of CA has in its correctional facilities. All they've done is move the non-violent inmates to county jails to quiet the courts and those facilities are also overcrowded. Solution! We're done! The article notes per 100,000, a prison population of 478 white males and 3,023 black males (about 85% black). Republican presidential candidates have received no more than 15% of the black vote since Gerald Ford did in 1976. Most states do not allow prisoners to vote. Deep red states incarcerate at a 50% higher rate than deep blue states with a comparable violent crime rate. Today's prisons and jails are much like the "snake pits" for mental health patients were in the past. Coercion and debasement are the rule of the day. It is all about punishing, beating down, and putting down. Its own subculture is one of survival and many come away broken and even mentally ill themselves. We treat PTSD in veterans but not prisoners. Many believe that prisoners deserve the worst treatment and too many feel they should be locked up in these penal asylums for ever. The Church itself provides little comfort or advocacy for prisoners and their treatment. Most local jails receive no services from clergy and state prisons are horribly understaffed with Catholic chaplains. The charities side of our ministries seems to have a huge vacuum in rehab services or reassimilation into the greater community upon release or parole. This article also appeared in print, under the headline "Prisoners Dilemma," in the August 4-11, 2014 issue.